Through collaboration and consensus with the City of St. Augustine and the community, the intersection of San Marco Avenue, West San Carlos Avenue and May Street will be reconfigured and widened to allow for better traffic flow in the area. The intersection improvement project includes the reconfiguration and widening of the existing San Marco Avenue and May Street intersection and widens it to include West San Carlos Avenue. The addition of dedicated right and left turn lanes, median modifications, synchronized traffic signals, sidewalks, shared bicycle lanes and HAWK (High-intensity Activated crossWalK) pedestrian signals will contribute to better traffic flow in addition to increased bicyclist and pedestrian safety in the area. The project also includes the replacement of an approximate quarter-mile of storm water pipe on May Street from San Marco Avenue to the Hospital Creek Bridge, east of Magnolia Avenue. The new intersection is scheduled to be operational in Spring 2019. Upon the opening of the intersection, the drainage project will begin. The combined cost for both projects is $9.2 million. Petticoat-Schmitt Civil Contractors, Inc. is the Construction Contractor. Should lane closures be required, they are restricted to between the hours of 9:30 p.m. and 6:30 a.m. daily. 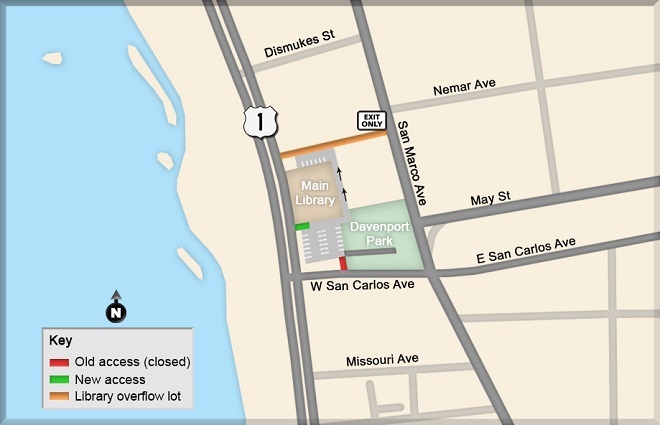 As part of the widening and reconstruction improvements, and Davenport Park access on West San Carlos Avenue will close when the new shared driveway on U.S. 1 opens. An additional driveway to the library’s overflow parking lot is also located just north of the new driveway access on U.S. 1. Variable message boards will be displayed on northbound and southbound U.S. 1 and West San Carlos Avenue to provide advanced notice to motorists of the new driveway opening (map on Documents tab). Nighttime lane closures from West San Carlos Avenue to Dismukes Street Sunday through Saturday from 9:30 p.m. to 6:30 a.m. for work related to the intersection project. Daytime lane closures from Binninger Drive to St. Augustine Road Wednesday through Friday from 9 a.m. to 3 p.m. for construction of a new turn lane. Daytime lane closures from Arapaho Avenue to Old Dixie Highway Monday through Friday from 9 a.m. to 3:30 p.m. for a new access/driveway. Daytime lane closures from Calle Madrid to Old Moultrie Road Monday through Friday from 9 a.m. to 3:30 p.m. for median work. Daytime lane closures from Rambla Street to Fifth Street Monday through Friday from 9 a.m. to 3:30 p.m. for FPL electrical pole replacement. Nighttime lane closures from Nelmar Avenue to Dufferin Street Sunday through Saturday from 9:30 p.m. to 6:30 a.m. for work related to the intersection project.